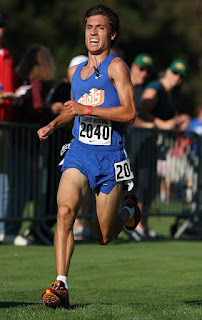 Today we chat with St. Joseph Notre Dame senior runner, Nick Ratto. During this past cross country season, Ratto helped lead the SJND team to a North Coast Section championship as well as a 3rd place finish at the state meet in Division V. He finished in 3rd place on the Woodward Park course running 15:45 as he passed multiple runners in the last mile to help seal a plaque for the Pilots. During last year's Track and Field season, Ratto was one of two juniors to qualify for the NCS MOC 800m. final. He has continued his fine running by winning the CA State Indoor Invitational. He finished in 2nd place at the Stanford Invitational in the mile and just recently won the Woody Wilson Invitational in a PR of 1:53.87. 1)What sports did you do your freshman year and what were some of your highlights? My freshman year I played basketball for my school's freshman team and also made the varsity tennis team. My basketball highlight from that year would have to be beating St. Mary's Berkeley (our rival school) in double OT in the last game of our season and for tennis it would have to be watching my best friend and future college roommate, Brian Aria, win a league championship as a freshman. I did not run XC or track during my freshman year because I assumed running three miles would not be very fun. I turned out to be very wrong in that assumption. 2) What led you into cross country and track and field during your sophomore year? What were some of your accomplishments during both sports? I started to run cross-country because my friends Louis Rodrigues and Brian Aria convinced me it would be fun. They told me that the coach (Tony Fong) was awesome and that it would get me in shape for other sports. I remember finishing my first mile time trial in just over 7 mins. After a few weeks, I started to rapidly improve and soon I was running with the top varsity runners. By the end of the year, I was the fastest runner on the team, helping our team just barely advance to the state meet. 3) What did you do differently going into your junior season in cross country over the summer as far as training? The main difference was that I ran more miles. I started running my sophomore year at the beginning of the school year and really did not have much of base. My junior year, my coaches really stressed the importance of getting a solid base of running and just getting some easy miles under my belt so that when the training picked up, I could handle it better. I think these miles really helped me, especially early in the year. I certainly did not come into my junior year in 7 min mile shape. Another aspect that really helped me my junior year was the addition of Gabe Arias to our team. He came in as super fast freshman who pushed me the entire season. 4) What were some of of your own accomplishments in xc as a junior? What about team accomplishments? As a junior I had a solid XC season. I finished 5th at both NCS and State and ran 16:09 at Woodward park. As a team we also had a really good season. We came in second at NCS, losing by just 1pt to Urban, and finished 7th at the state meet. 5) What about during the track and field season? PRs for 400, 800 and 1600? I think my junior track season was the turning point in my running career. Coming into that year, I liked running, but I never really thought of myself as very fast. My coach Tony Fong brought in Alex Mason, a former 800 runner of his, to train me. When I first talked to Alex, he told me he thought I could run a 1:55 800 and 4:30 1600 by the end of the year. At that time, with PRs of 2:06 and 4:45, those times seemed utterly unattainable. I thought Alex was totally insane. It turns out he knew what he was talking about. By the end of the season, Alex’s tough workouts got me PRs of 1:56.32 in the 800 and 4:26 in the 1600. More importantly these workouts gave me the confidence to run with some of the best runners in the section and the state. 6) After the success of your xc team in 2010, what were the team goals going into the season? What about your own goals? After the one point loss to Urban, our team came back focused and determined. Everyone on the team had worked so hard in 2010, yet somehow we still came up just short. We knew that in order to not let that happen again, we would have to work even harder. We came in to the season with the goals of winning our league championship, winning NCS in the fastest team time for a D5 school at Hayward, and finishing in the top three at state. These were pretty lofty goals, and at times it didn't seem like we would be able to make them all happen. But every time we hit a rough patch, the team banded together and we were able to achieve all of our goals. As team captain my personal goal was to help the team achieve its goals in any way that I could. 7) Tell us a little about your state meet race in cross country. What was the plan going in and how did the race turn out for you and your team? When did you guys find out that you finished in 3rd place and what was the team reaction? Our plan going into the race was to just run our own race and let everything handle itself. We had worked really hard all year long and we knew if we ran well we would reach our goals. My race plan was to try to relax for the first two miles and to hammer the last mile. The race ended up being really close with only a few points separating the first, second, and third teams. One of the other coaches appealed the original results and it took several hours for the official results to be released. This, combined with the closeness of the race, meant that nobody could be certain of their place. I started to get really anxious, especially after the results of races that happened long after ours started to come in. Finally, after what seemed like an eternity, the results were posted. In the end we came in third, 8pts behind second and 2pts in front of fourth. Upon finding out the official results my initial response was relief, followed by pure excitement. I hugged my teammates and coaches endlessly and I remember never wanting that moment to pass. Our goal from the very beginning of the year had been to make the podium at state, and we were able to accomplish that, even in the most competitive year in the history of d5. 8) What did you do over the winter as preparation for your senior track season? Any races? Supplemental training? Weekly mileage? Workouts? For the first two weeks of winter I didn't do a whole lot of running. I wanted to let my body take a rest. After that I began to run easy miles with a track workout or two thrown in every once in awhile. A ran a few races during the winter, opening with a 1:55 PR and closing out the season with an indoor state title. One thing my coach Alex wanted me to focus on this year was strength training, and I think that training has really helped me so far this year. My weekly mileage has been somewhere between 25-50 miles, with an average of about 40. One new workout we did over winter was a strength endurance workout that mixes 400 or 200 intervals with simple body weight exercises. 9) What have been some of your accomplishments to date during this current track season? Tell us a little about the Woody Wilson race. My first race this season was the 800 at the Dublin Distance Fiesta, which I won in 1:55.96. Another big race for me this year was the mile at Stanford, which I came in second at 4:17, although I did PR by almost 10 seconds. My Woody Wilson invite started off in an interesting way. I checked in late to the 800 and was almost not allowed to start the race. Thankfully the officials allowed me to run and I ended up running a pretty good time. I PR'ed with a time of 1:53.87, going out in just under 56 and coming back in just over 58. 10) Favorite track distance? Favorite track workout? Favorite track invitational? Favorite opponent(s)? Favorite xc race? Favorite xc invitational? Favorite long run? Any team traditions? My favorite track distance is 800 because I can never run the 3rd lap of a 1600. My favorite track workout is a strength endurance hill circuit we do. My favorite track invite is the Dublin meet because of the sombreros and also because it is run by Chris Williams, a former SJND runner. Two of my favorite opponents are Duncan Calvert of St. Mary's Berkeley and Sam Kane of Bishop O'Dowd because they are both good guys who I know will always battle in races, but my all-time favorite "opponent" is Gabe Arias. He always pushes me in practice and races and he's beaten me on a number of occasions, although I do always beat him at state (if ever you run into Gabe, remember to tell him that). My favorite XC invite is the Stanford Invitational because there are no hills. My favorite long runs are with the West Valley Track Club, which is also a summer team tradition. 11) You are going to UC Davis next year. How many schools did you visit and what led you into choosing Davis? Some other schools I visited were USF and UC Santa Barbara. Both are great schools with good running programs, but at the end of the day they just weren't right for me. Davis was the best choice for me on many levels: academically, athletically, and culturally. I'm really excited to go to UC Davis and I feel that it was the best choice for me and my future. 12) What is your relationship to Ray Ratto and any funny stories? Ray is my dad's second cousin, but he is more like an uncle to me. A good story of him happened at NCS last year. He was in one of the top rows and in some of the videos you can clearly hear him yelling at me. He's a pretty hilarious guy and most of the stuff he is saying is pretty funny. 13) Tell us a little about your coach and how he has helped you develop into the runner you are today. Tony Fong is the best coach I could ever ask for as a runner. He made running fun for me and gave me a passion for running. This passion has taken me farther than I could ever have imagined and I owe it all to him. I would like thank my friends and family for being so supportive. I would also like to thank my teammates and coaches for pushing me and making me the runner I am today. Finally, thank you Albert for running this website. You do a great job of promoting high school XC and Track. Great interview. Great kid. Hope he keeps improving through college! Can't forget that SJND's time at ncs championships for xc was also one of the top times in the section regardless of division. D5 sure does have talent! I coach at a school in Division V and can verify that the competition in that division is really good and seems to be getting deeper by the year. YEAH D5 goes hard! Nick is the mannnn. D5 usually has a lot of the really rich kids at private schools, so it's no wonder they are doing better with the resources they have. and what "resources" do you need to be a good runner?-all you need is a pair of running shoes and hard training. Thats part of the beauty of sports is that its one of the few places where you can't buy success. It would almost be harder to run at a smaller school since they almost never have their own track and the smaller teams mean fewer good teammates to push the really talented runners in practice. Having to not work a job (extra time for practices, meets) is one of the big benefits. most private schools also are not held to the same boundries as public schools. An athlete can " pick " their school to attend not having it choosen for them. Better coaching = better runners as well. I can only speak for myself but the majority of my kids have never run track or cross country before high school. We do not have a track and during this current season, we have been able to go to the track once a week. I am not sure what the better resources you are speaking of above. I will give you the not working a job part but there is plenty of other things they are involved with that take up a lot of their time. we practice about an hour and a half a day so I am guessing that is a little less than most other teams (public or private). I am fairly certain that nobody has "picked" this school for athletic reasons. Despite all of the above, I am always striving as a coach that my kids compete to the best of their ability and we will not make any excuses if something is not at our disposal. Finally, in regards to private vs. public, you are either good or you are not. You either put in the work or you don't. I am pretty familiar with a lot of the good runners in Division V and they all had to work their buns off to get where they did. Nobody handed them anything in terms of their athletic success. They got it done and for that they should be congratulated. Very well put Albert, I can say that Del Campo never, ever works out on a track. Tracks are for racing. Who needs a track ? They still have a dirt one. As a parent who personally went to a public school, but has a child attending a "rich" private D5 school, my feeling is that the "rich" kids do have advantages. During my times, I don't think I spend over $100 on shoes my entire 4 years in high school. My son and his peers routinely buys $100 shoes as the older pairs get "worn out". The reason, and rightfully so, is to prevent injury. When my son first went out for track, I instinctively brought the cheapest flats and cleats I can find. Relatively soon thereafter, my son tells me to buy these fancy shoes to stay competitive. Do those really help? I have my doubts, but in a sport where the mental aspect is underrated, I suspect the psychological part of having the best shoes is underrated as well. The other "resource" that rich private school as is transportation to training sites. Most private schools have vans to take kids to the training trails. It is probably not a coincident that the best cross country teams in San Mateo County High School District is Aragon and Carlmont, schools on the hills, whereas the flatland schools San Mateo and Burlingame don't do as well. I coached at both San Mateo and Burlingame at one time. They have both been successful in the past so no reason why they can't be again. wow, Alex Mason seems like an amazing guy. i think people would be surprised about how many schools (public or private) don't have an actual track. To whoever said that D5 schools like SJND are priveliged, I would like to remind them that SJND does not have a track. Silly argument, public schools are better in XC and track than private schools. Go ahead, look at the results.